The NEW Topaz now has wing fuel tanks as standard with additional larger capacity reserve tanks located under the baggage compartment, it employs easy entry forward hinging doors with 2 huge baggage lockers (with external and internal access) on both sides of the fuselage. The electric powetred flaps and elevator trim are a dream to use, both push-button joy stick operated. This glider heritage mated to a full composite structure offers wonderful visibility, great range and superb comfort. ​ TOPAZ aircraft are manufactured from carbon fiber using vinyl-ester resins which have far better high temperature thermal resistance qualities to the more conventionally used epoxy resins. The 120cm wide cockpit can also accommodate larger pilots comfortably - unusual in many light sport aircraft designs. ​ To reduce the chance of corosion stainless steel components are used extensively, the flight control system is stainless - rods instead of pulleys (no teleflex cables), the nose gear is stainless,even the engine mounts are also large diameter stainless steel, no carbon steel like other aircraft, no rust, no corosion. ​ An absolutely stunning full gloss paint finish (no gel coat), a smooth efficient exteriour skin (no pop rivets), leather seats as standard, two large capacity cargo compartments behind each seat with locakable exteriour access doors, heavy duty wheels and tyres, a ballistic parachute option, and much more. ​ Pilot and passanger comfort and protection are enhanced with a reinforced cockpit area, the high wing gives superior protection roll over compared to most low wing designs and the TOPAZ has an aircraft parachute option for additional safety enhancement. The comprehensive instrument panel is equipped with far more than just basic instrumentation and can also be fully customized to individual specifications using any number of different panel layouts and avionic options. The TOPAZ features a very strong composite sprung landing gear with hydraulic disc brakes that are activated via the single brake lever with parking lock convenience all attached to a center control stick. The Topaz is not a copy of someone else's design, it is a unique and very special aircraft. No struts so less drag, no struts also ensure a better view and easier entry and exit, no aluminium wings so no 'oil canning' also no rivets so no corosion, no carbon steel so no rust, you also won't find fabric covered surfaces used to offset weight limitations. ​ With a high wing there is no 'greenhouse effect' of cooking in the hotter months, if it rains you will not get wet when getting in and out, preflight checks are so much easier (no crawling under wings), and service work is easier, no floors to pull up, the instrument panel comes off if needed with two bolts and two electrical plugs - brilliant! The Topaz will reward the individual who appreciates fine handling and balanced controls. The wing design delivers spectacular climb rates and a phenomenal glide ratio,it achieves what few others can - at any altitude. ​The TOPAZ has a one-piece, tapered, cantilever wing, mounted on the fuselage. The airfoil section,NN1817 was used due to its very good aerodynamical characteristics and very high resistance to enviorenmental performance loss. ​ The wing has a shell-like composite construction with enclosed spar. Ailerons are made of carbon laminate designed with high stiffness and a relatively low mass for anti-flutter protection. Ailerons have intergral mass balance elements at their ends. Electric controlled composite flaps, are fitted to the wing. ​ The fuselage structure is made of two symmetrical pieces, dual layered with a honecomb core, which are joined together and additionally toughened. Pressure and temperature controlled moldings are used, the process is unique and patented. The cockpit area is significantly strengthened for pilot protection creating a shell like cockpit. 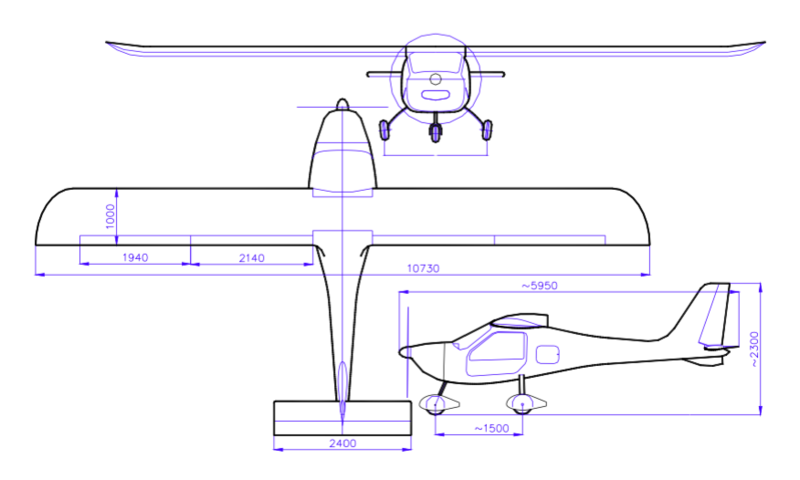 The classic, tapered tail plane is a composite construction and an integral part of the fuselage. Stainless steel push rod controls are used throughout for the flight controls with sealed bearing linkages - no pulleys, cables or teleflex. Elevator trim is spring-actuated and powered with electric motor controlled directly from the joy stick. Multi stage flaps are electric, also easily controlled directly from the joy stick. The windscreen is made of UV-resistance tinted Plexiglas, the doors are formed as carbon composite frames using 3mm Plexiglas. The main gear legs are made of glass composite. The main wheels have hydraulic brakes with parking brake function. The plane is equipped with ROTAX 912 engine (80HP - 100HP) and a composite 3 blade ground adjustable propeller. The engine uses radiators and ducted air for cooling with no need for a frontal weather exposed opening. The engine mount is constructed of heavy duty stainless steel for corosion protection. An effective and efficient cabin heat system an intergral part of the design.